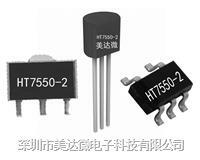 The HT75XX-2 series is a set of three-terminal low power high voltage implemented in CMOS technology. They can deliver 100mA output current and allow an input voltage as high as 24V. They are available with several fixed output voltages ranging from 2.1V to 12.0V. CMOS technology ensures low voltage drop and low quiescent current. Although designed primarily as fixed voltage regulators, these devices can be used with external components to obtain variable voltages and currents.